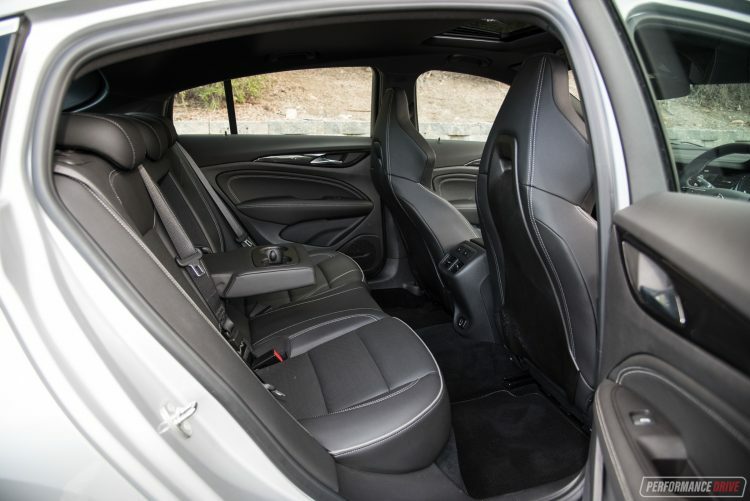 The affordable large sports sedan market has changed dramatically. For starters, you can forget Australian made. And, technically, most sedans aren’t even sedans these days; in the case of these two, both feature a sporty liftback-style tailgate and four-door coupe roofline. However, if you do want an affordable large sedan with racy credentials, the new Holden Commodore VXR and Kia Stinger are at the top of the most-wanted list at the moment. For this comparison we’ve got the Commodore VXR, which is available in a single trim level and with a 3.6-litre naturally aspirated V6. Prices start at $55,990. 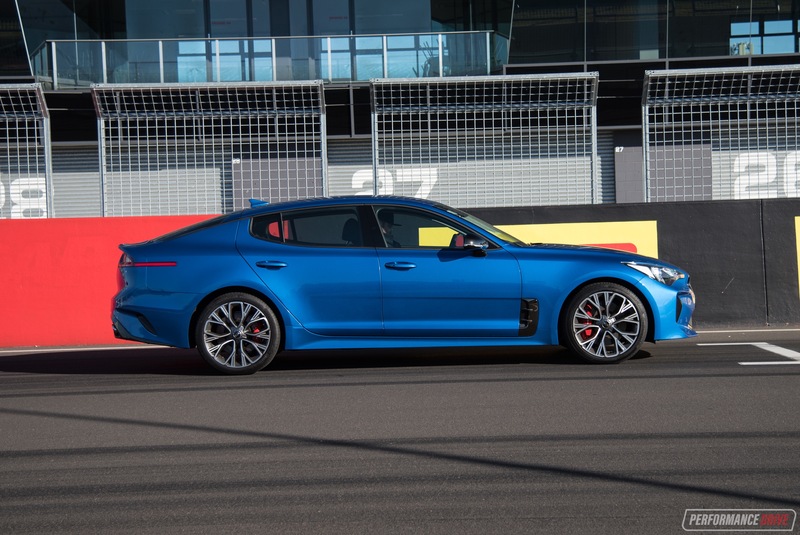 In Micro Blue is the Kia Stinger 330Si, which is priced exactly in line, from $55,990. 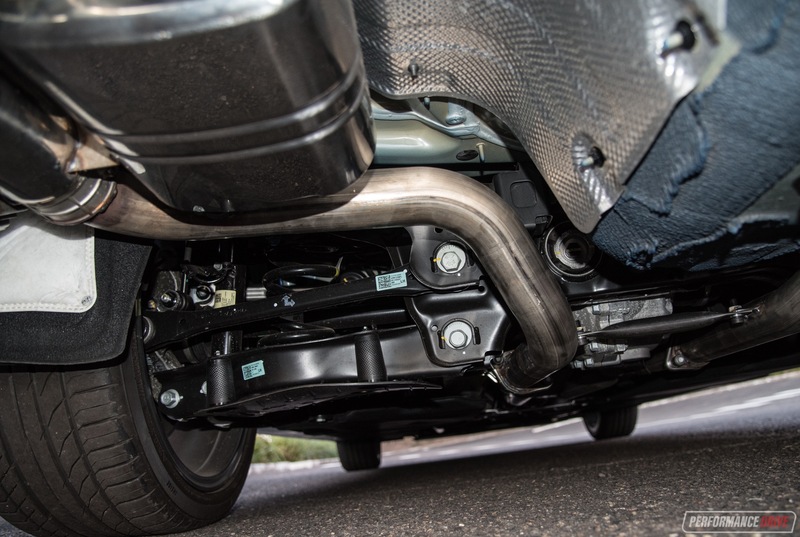 Fortunately for our (and your) ears, this test car features the bi-modal sports exhaust option which calls for an additional $2298.18. 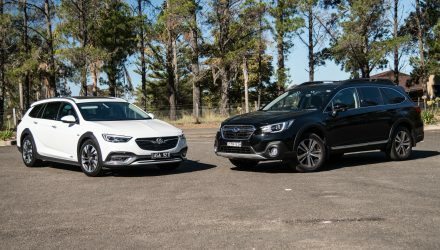 The Commodore is all-wheel drive and the Kia is rear-wheel drive. 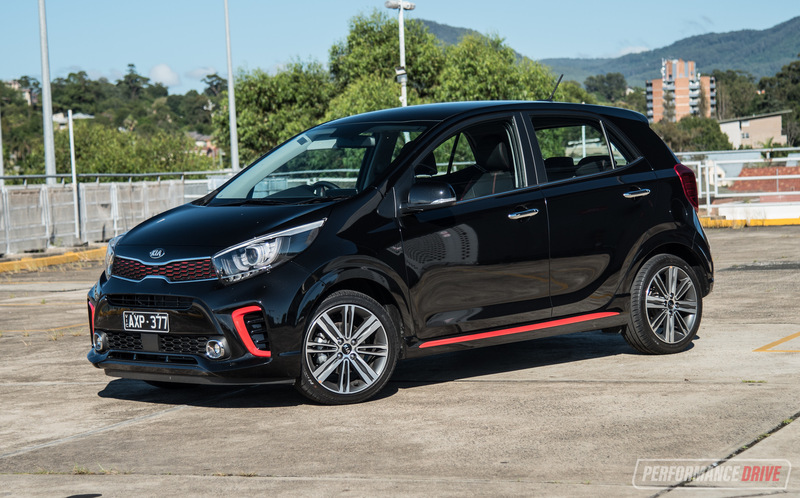 Both come with an auto transmission only, with eight speeds in the Kia and a mountain-bike-like nine in the Holden. 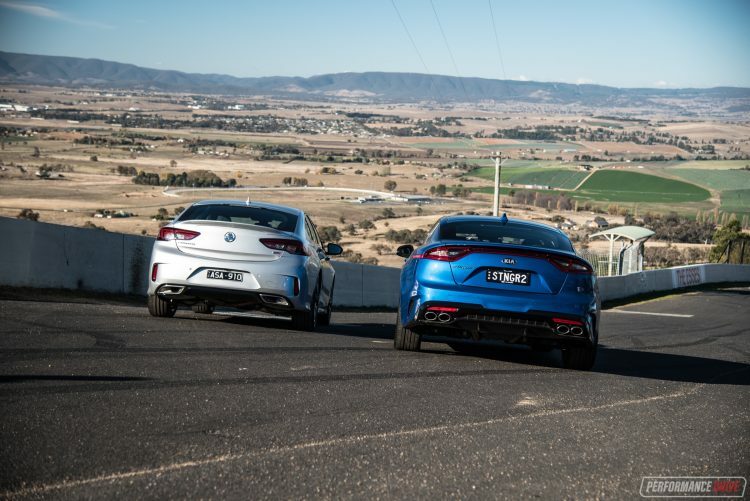 We’ve tested the Stinger before, in 330Si and GT trim, and we’re sure you already know plenty about the car. But there are some details about the Commodore you might not know. 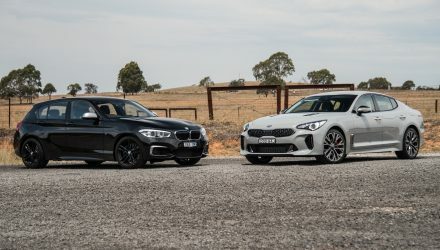 So for this comparison we’ll mainly focus on the Commodore and see how its stacks up against the Stinger class-benchmark. The Commodore is heavily based on the Opel Insignia and is made in Germany. It’s 67mm longer than the Stinger, 7mm narrower, and 55mm taller. 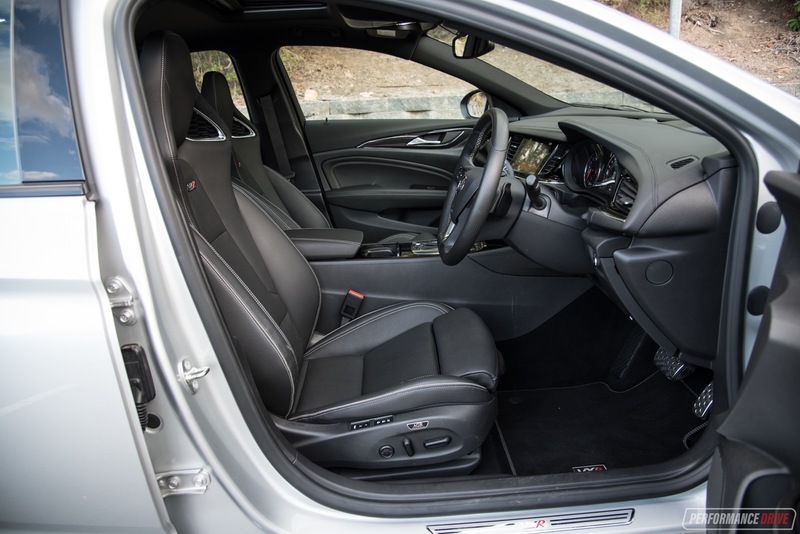 It’s also 67mm shorter than the previous Aussie-made VF Commodore SS, 35mm narrower, and stands 16mm lower to the ground in terms of roof height. Being four-door liftbacks these two cars are quite low-slung and thus require some yoga experience to get in and out of. 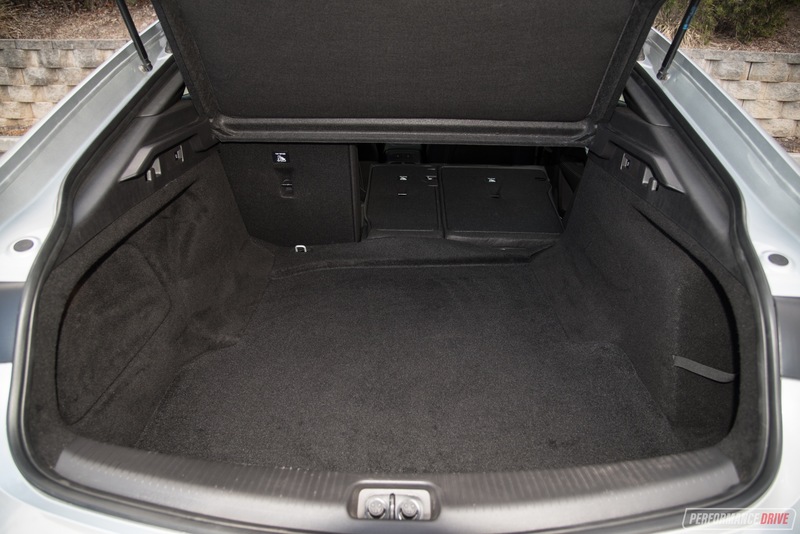 The rear seats are especially low, with a low roofline perfect for reshaping heads into a golfball-like surface. Once you’re in, the Stinger does seem more spacious and open, with fewer swooping panels and trimmings creating the perception of more space. Legroom and shoulder space is pretty similar between the two. Up front, the Stinger is the most practical. 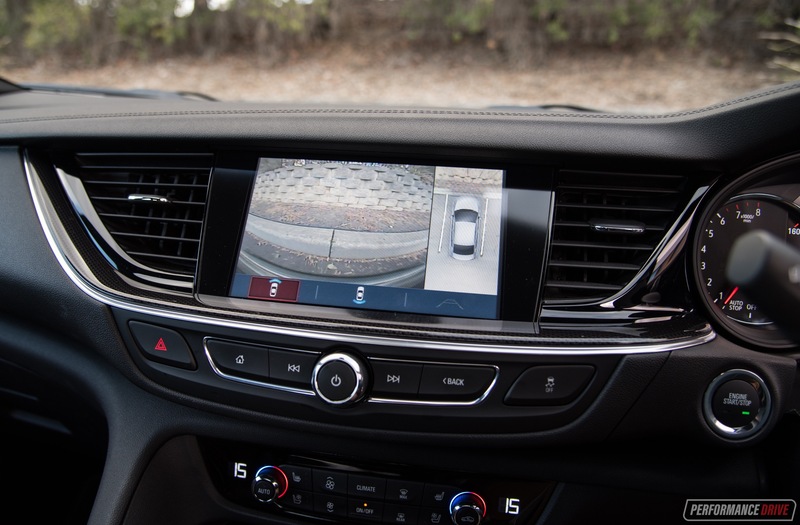 It uses a more conventional and perhaps less inspiring dash design, with an almost vertical presentation for the touch-screen and controls. Over in the Commodore, the design is certainly more interesting. 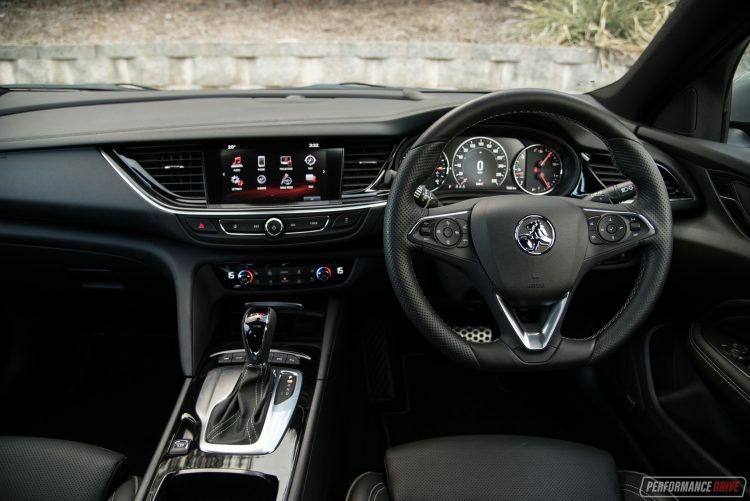 Up on the top is an 8.0-inch touch-screen matching the Stinger’s size, while the climate controls are clearly fancier in the VXR. Build quality and fit and finish edges ahead in the Stinger, with nicer buttons and a nicer feel for most surfaces and controls. In this area, it makes the Commodore’s decor seem under-par in terms of quality and refinement. Overall comfort is higher in the Stinger, too, thanks to softer seat cushioning and softer suspension in the normal drive modes. 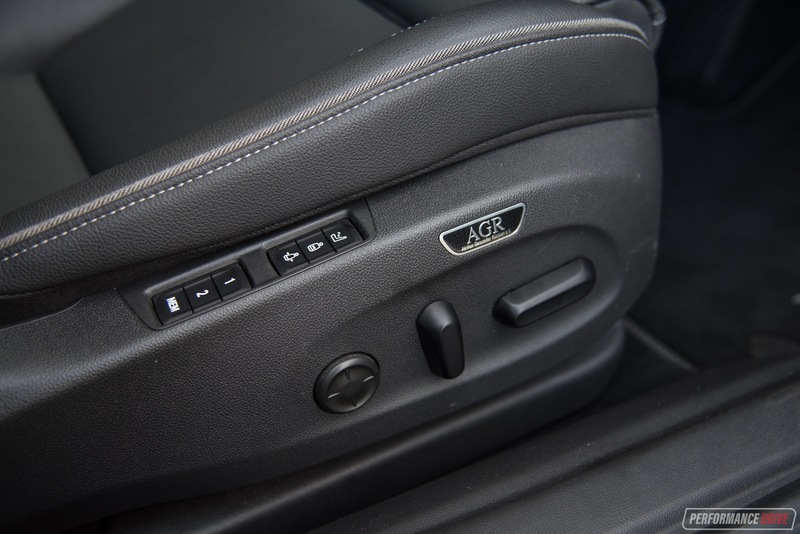 Holden has done well with packaging though, fitting seat heating for the rear, dual USB ports in the rear (Stinger has 1 USB and 1 12V socket), and massage functioning for the front seats. The Commodore driver also gets head-up display as standard, helping to improve long-distance comfort and reduce fatigue. Positioning in the driver’s seat is natural and with enough adjustment range in both. 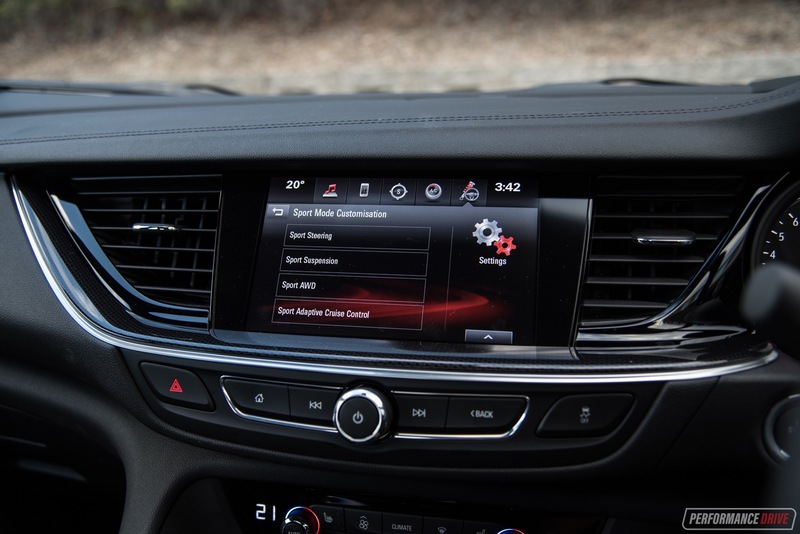 Both media systems come with Apple CarPlay and Android Auto connectivity, with in-built sat-nav, digital radio, and a rear-view camera (the VXR adds side-view as well). Despite featuring eight speakers over the Kia’s nine, the stereo in the VXR absolutely cranks out the tunes. Bass and clarity is noticeably superior. 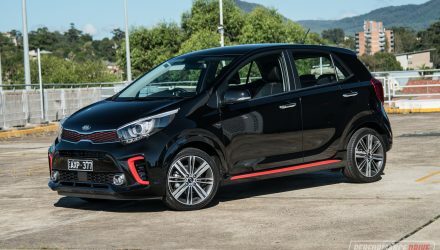 Those wanting more in the Kia will have to step up to the GT variant which comes with a 15-speaker Harman/Kardon system. 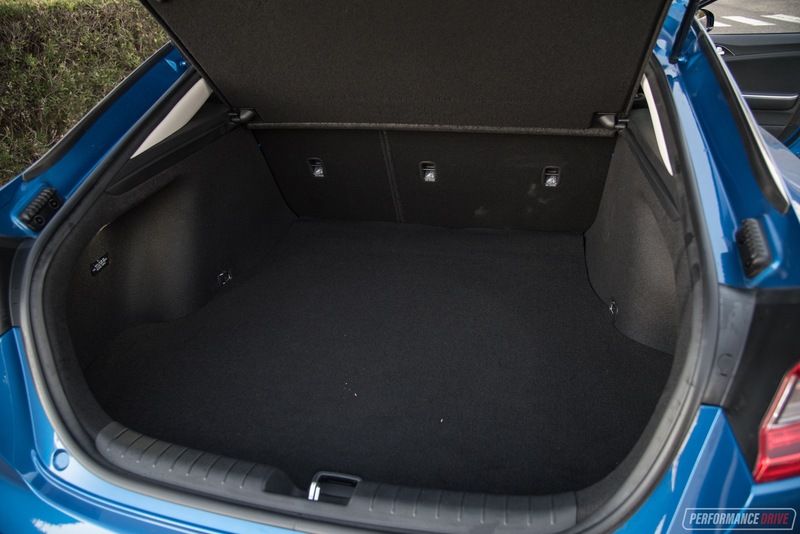 Boot space goes to the Commodore, which offers an extremely long/deep boot floor that can be expanded further with the flat-folding rear seats. 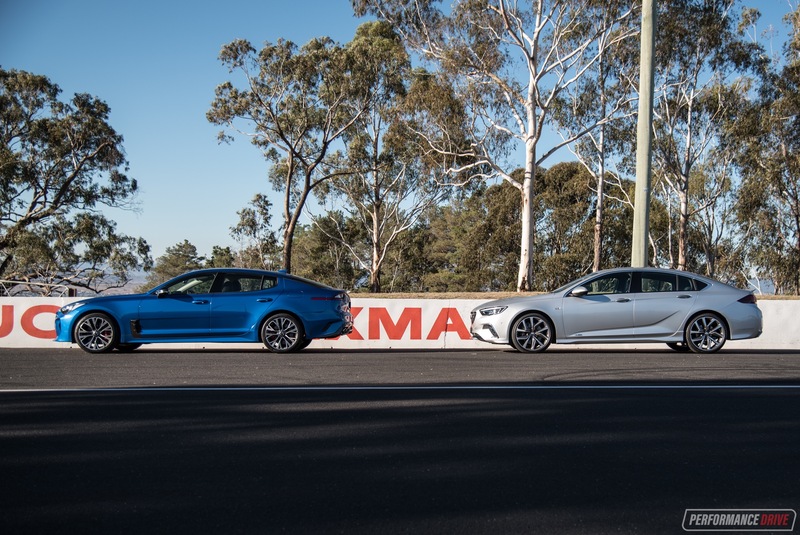 On paper the specs show 490L/1450L for the Commodore and 406L/1114L for the Stinger. 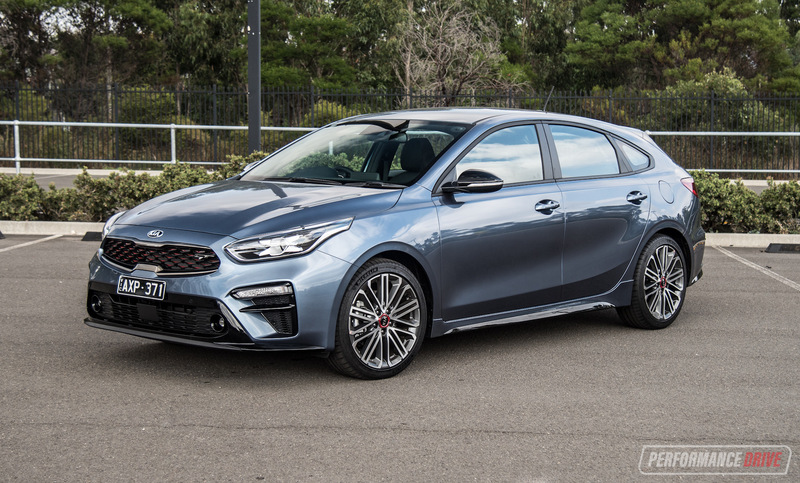 The Kia’s useable space is hindered due to the low-swooping tailgate, which can make it difficult to load in taller items in comparison to loading goods in the Commodore – be careful you don’t shatter the rear windscreen. 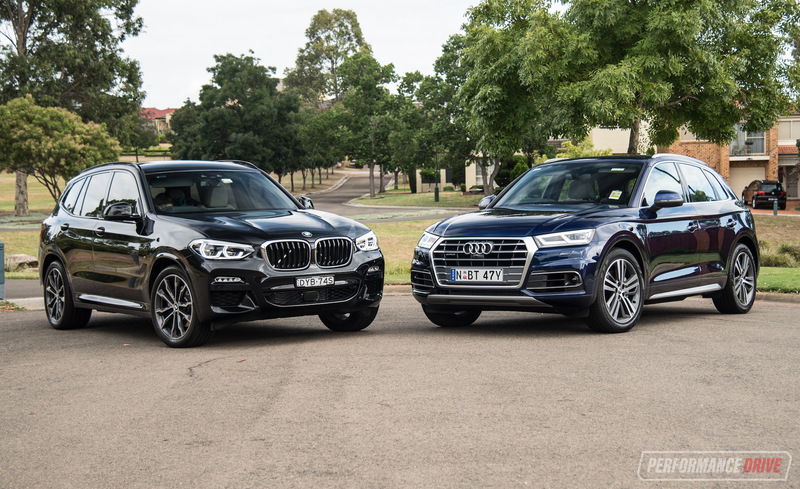 Some might argue these two cars offer a slightly different personality and skill set. The Stinger can be regarded as more of a GT car, as in grand touring out on the open road, while the VXR badge is usually reserved for only the most serious track-ready models from GM’s Euro division. But we don’t care. We’re pitching these two head-to-head because they both come with a powerful V6, measure about the same size, and are priced exactly neck and neck. 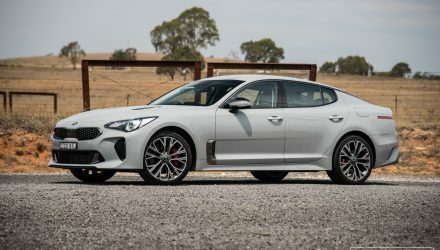 Hyundai-Kia have developed the 3.3-litre twin-turbo V6 primarily for the Stinger, but it will be used across other models including in vehicles from Hyundai’s premium brand, Genesis. This means it needs to be reliable and efficient; it’s not a highly-strung, delicate unit. 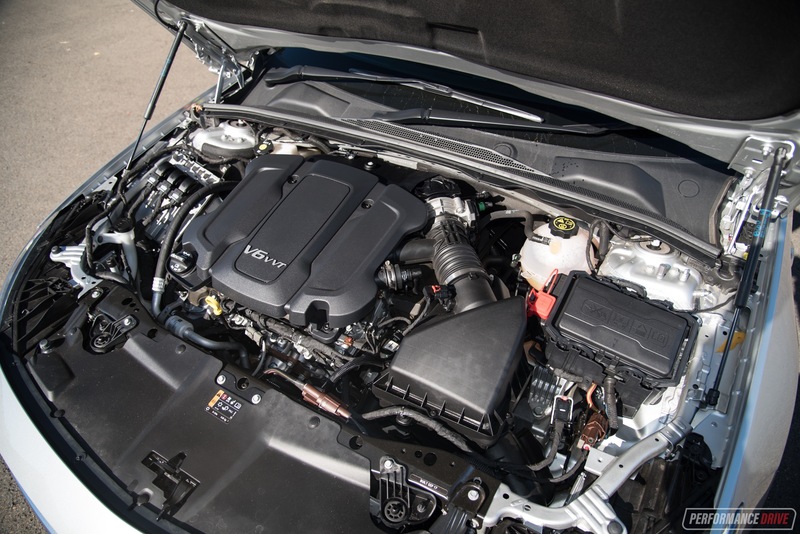 Peak power is rated at 272kW and is achieved at a neat 6000rpm. Peak torque is stamped at 510Nm and is available across a broad rev band, between 1300-4500rpm. 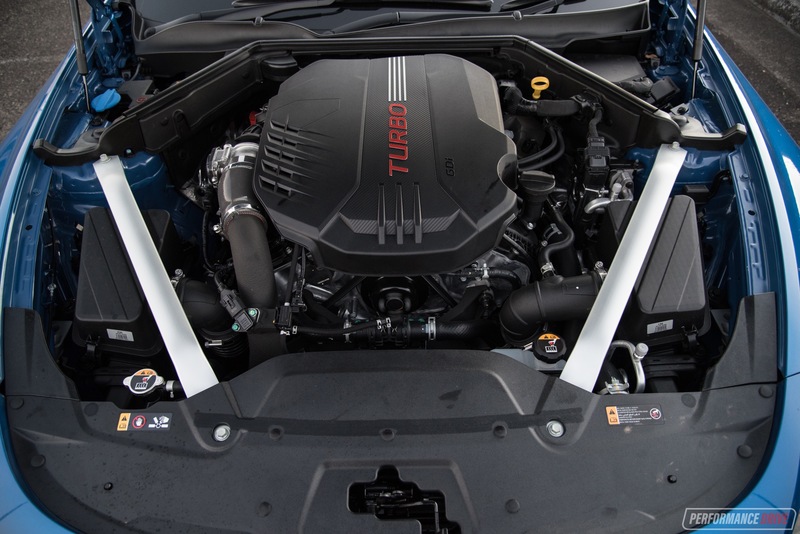 Turbo boost, all 12psi of it, builds almost immediately to provide a strong low-down surge, but then it does tend to plateau off once the tacho swings past around 4500-5000rpm. 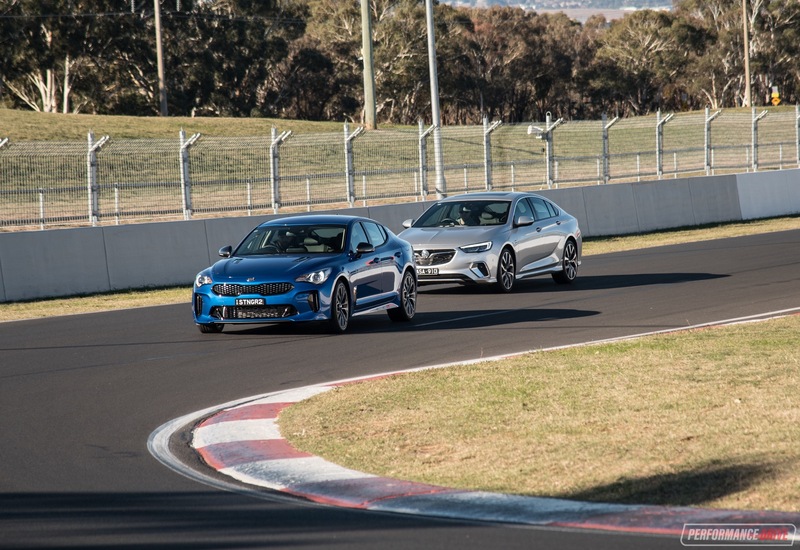 In contrast, the new Commodore comes with an old-school naturally aspirated engine. 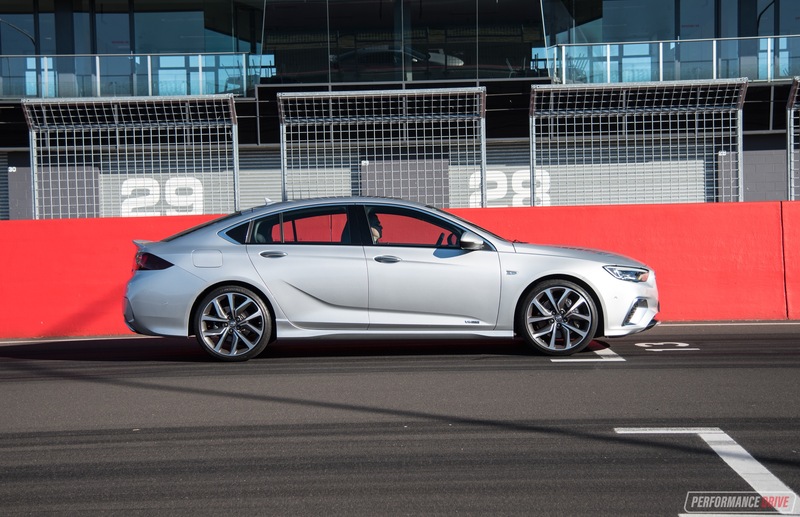 The 3.6-litre ‘LGX’ V6 isn’t offered in all Opel-based models, only in the Buick Regal version of the Insignia, sold in the US and China. There’s nothing really exotic or overly special about the engine. It debuted in 2016 in Cadillac models, featuring an over-square stroke ratio with 95mm bores and an 85.8mm stroke. This is ideal for high revs. Also ideal is the compression ratio of 11.5:1, helping to provide a free-revving character that doesn’t hit the rev limiter until 7200rpm. Peak power is rated at 235kW and reached at 6800rpm, while peak torque is quoted at 381Nm and is available only at 5200rpm. We enjoy both engines, almost equally, actually. 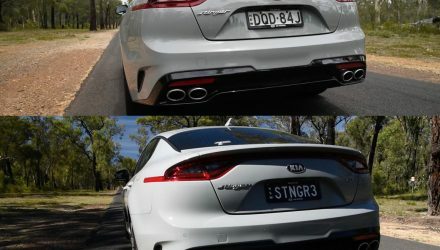 The Stinger’s low-down torque and overall pulling power always puts a smile on your face, and the sound produced via the sports exhaust option is deep and characterful, if a little short on revs. By comparison, the Holden’s unit loves to rev, and rev high. Traditional sports car fans might enjoy this a little more. Down low and off the mark there is some delay as the drivetrain gets an understanding of what you’re trying to do, but once the car is moving, even upwards of just 20km/h, the acceleration is impressive and progressive, in line with the revs climbing. As for the all-important acceleration figures. 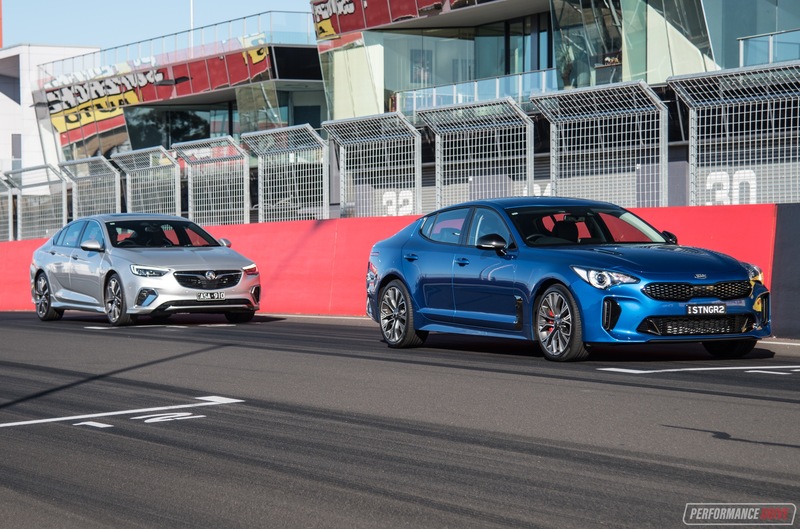 Across the 0-100km/h sprint in the Stinger, we bettered our previous time of 5.28 seconds, clocking it in 5.18 seconds. We’d say the difference is almost purely down to the temperature, which was a rather chilly 11 degrees C this time around. The quarter mile also improved from 13.56 seconds to 13.41 seconds. Unfortunately for the Commodore, the Stinger is in a different league in this department. The best we achieved during similar conditions was 6.59 seconds and 14.67 seconds in the VXR, respectively for 0-100km/h and the quarter. 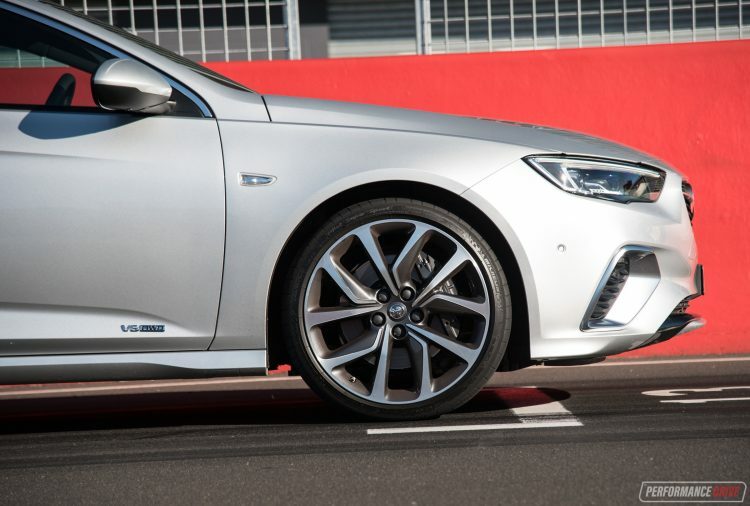 In-gear thrust is where the Stinger’s twin-turbo engine really pushes ahead of the Commodore’s V6. Our timing shows 60-110km/h comes up almost a full second quicker in the Stinger (see spec box above). Out on the road the Stinger does feel more powerful and faster. Nail the throttle and it will push you hard into your seat. The Commodore’s acceleration experience is almost as exciting as it does add an aural element, screaming with more theatre and commotion. 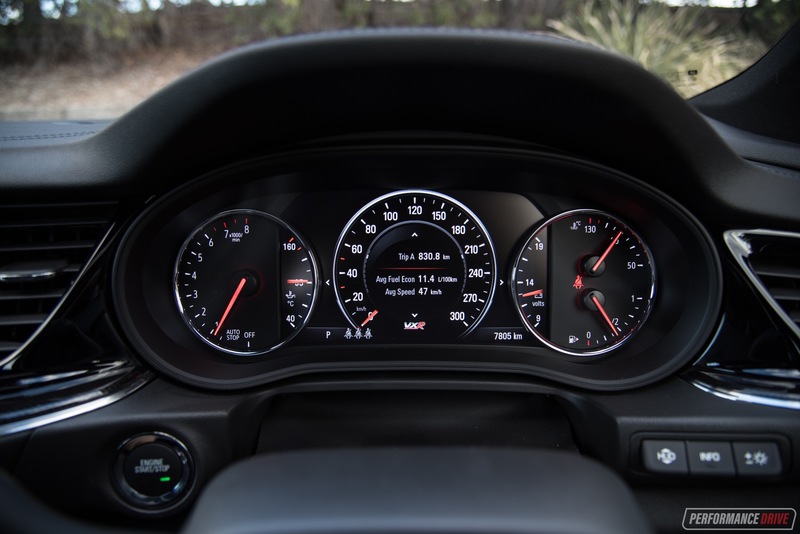 We also like the nine-speed auto over the Stinger’s eight-speed. First gear is a little too long for our liking in the VXR, but from there it hammers home the gears with quick succession, rapid-firing down the road. 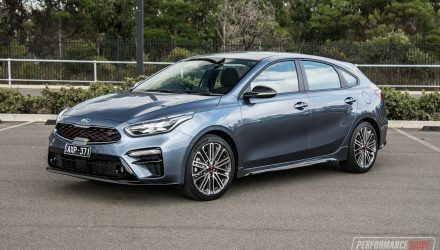 Kia has developed its eight-speed in-house. It is very smooth and the ratios are well matched to the engine’s outputs during normal driving conditions. 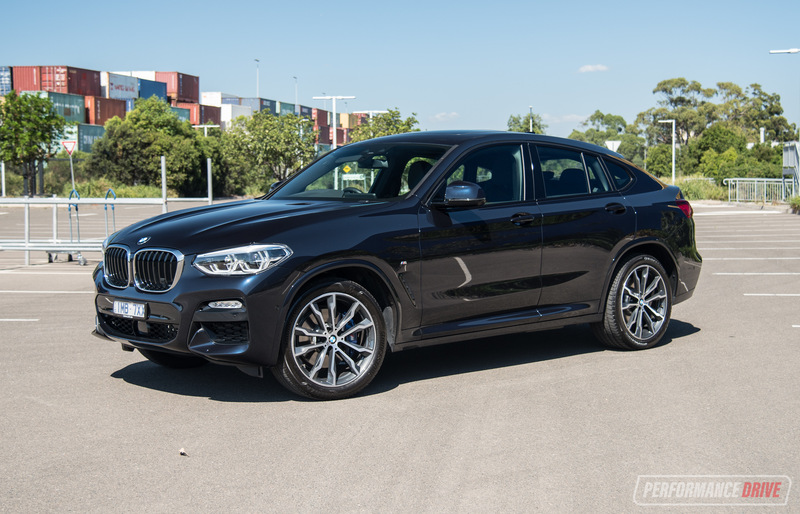 But, during sportier, high-tempo demands the transmission lacks that confident, quick-shifting punch. 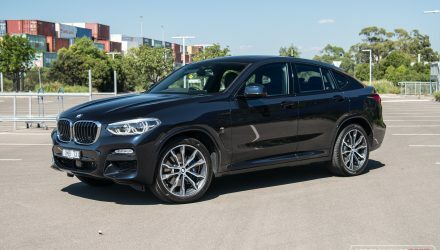 During our test the transmission also overheated and went into some kind of limp-home mode – this issue could be subject to this test car only which has under 800km on it and perhaps hasn’t been run in properly. Around the bends the Stinger is lots of fun. 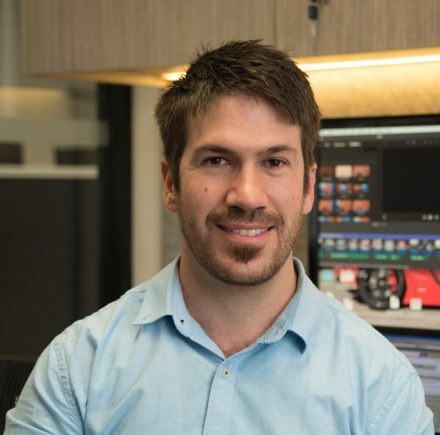 You can kick the tail out for short drifts with the stability control off, but – for us at least – the safety systems can’t be switched completely off. During mid-slides we noticed the front wheel brake coming on automatically to try and correct the car. 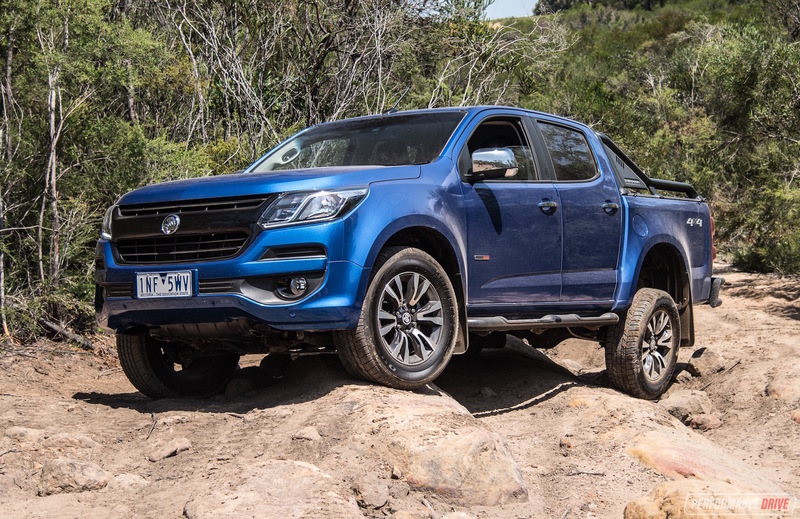 Without going all-out and driving like a hooligan though, the Stinger’s chassis is superbly balanced, with a hint of body roll allowing you to throw the weight around a bit. 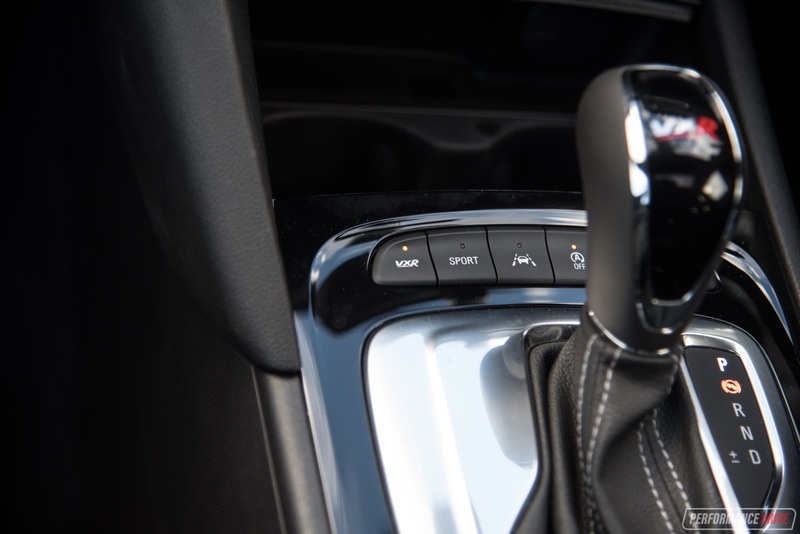 Communication through the steering is satisfying, with a good weighted feel in the sport mode. The gear ratio is pretty quick as well, helping to get the nose tucked into corners immediately. The Stinger’s body is made from 55 per cent Advanced High Strength Steel, which helps create a feeling of solidity, and in turn, a responsive set of controls. However, it is a rather heavy beast, tipping the scales at 1780kg. In our opinion this is simply too heavy for this style of vehicle. 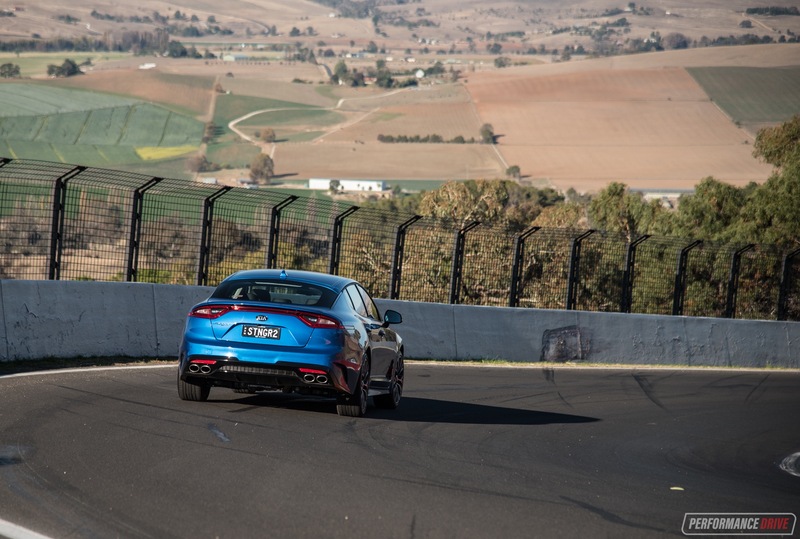 Agility through tight bends, such as down the corkscrew at Mount Panorama circuit, does unveil some body wobbling and nervousness in the chassis. The argument presented about this being a GT car could go some way to justify this. We always liked the old Opel Insignia VXR‘s handling. And it seems some of that character has been carried across to this new model. 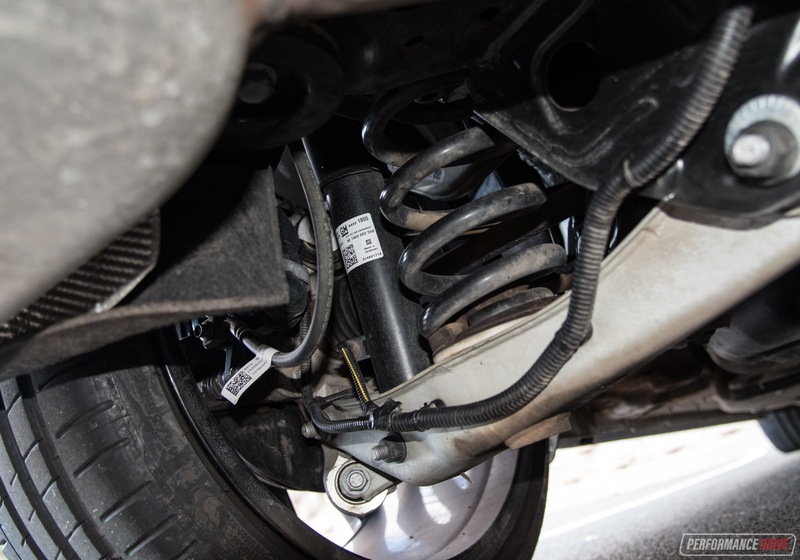 In VXR mode the dampers are firmed up to almost uncomfortable levels for ordinary roads, but on perfect roads and circuits, this setting makes it a lot more agile and rigid than the Stinger. Turn-in is much sharper, and it’ll hold its line better than the Stinger. It also feels less upset when you chuck it from one direction to the other. Being all-wheel drive with the clever GKN torque-vectoring Twinster differential at the rear, grip levels are astounding. 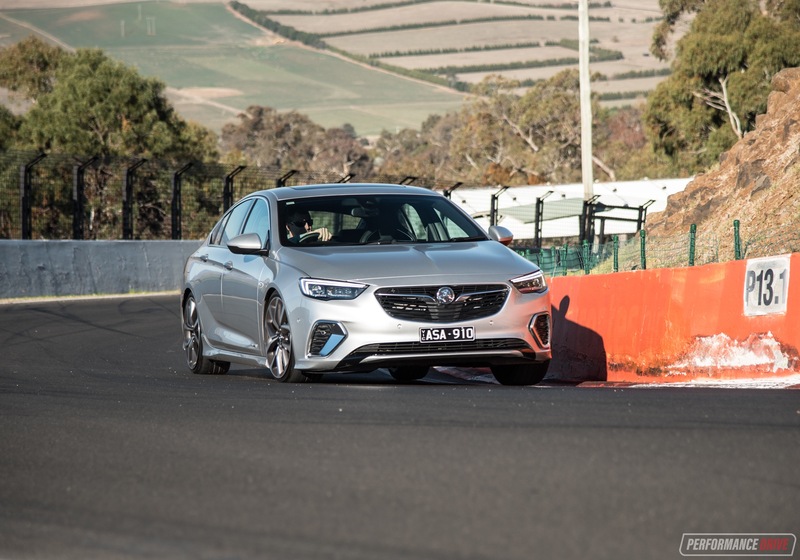 In saying that, the Holden is fitted with superior 245/35 Michelin Pilot Super Sport tyres over the Kia’s 225/40 and 255/35 Continental ContiSportContact tyres. You’ll have to be driving like a maniac to get the VXR unstuck, put it that way… even with two wheels off the ground. Overall, we award the Stinger as the best cruiser and the nicer daily driver. 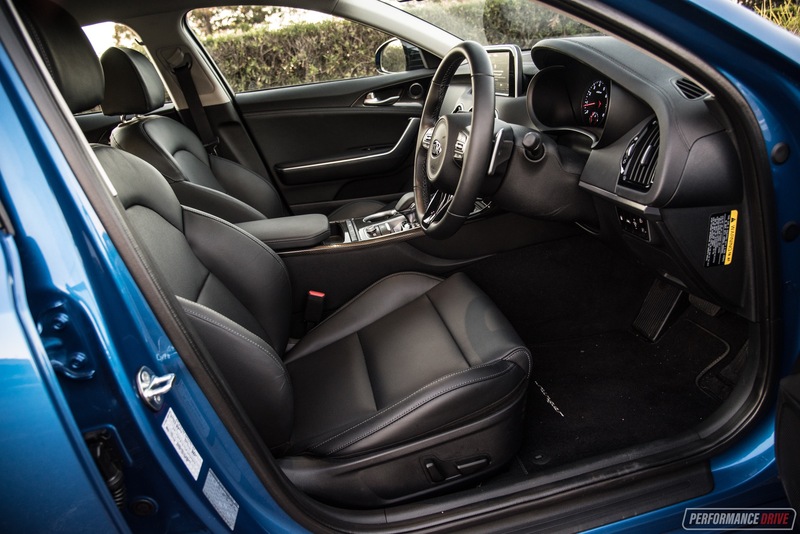 But, to our surprise, the Commodore VXR has it trumped for pure handling edge and agility. 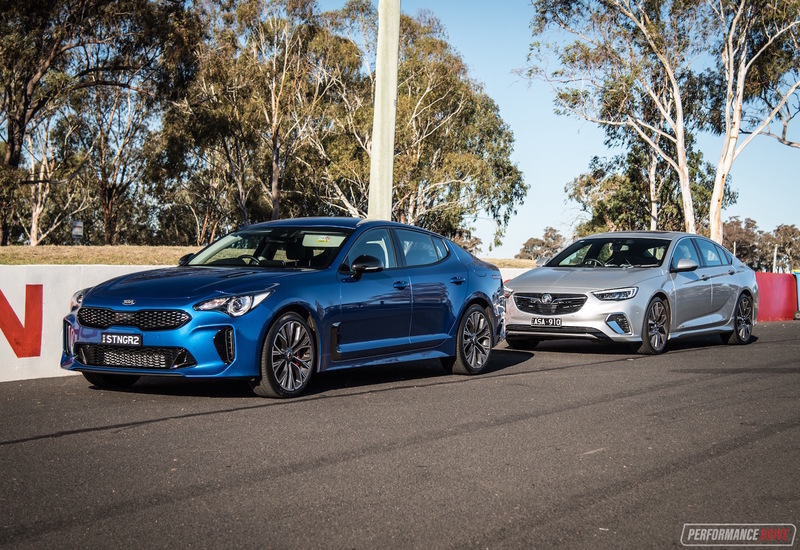 In between the corners the Commodore is noticeably slower and doesn’t stand a chance of catching the train-like momentum of the Kia’s twin-turbo capability. 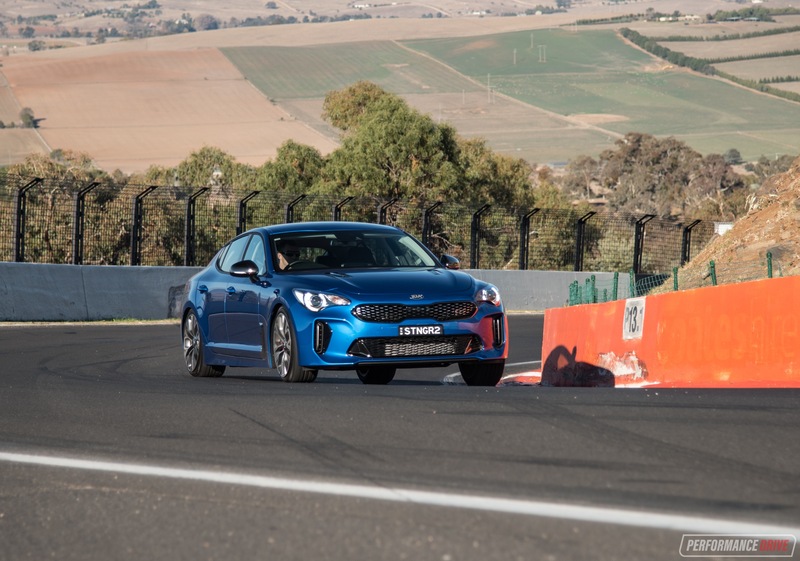 Since these vehicles are likely to spend most of their time off the track, we hand the outright driving experience to the Stinger. 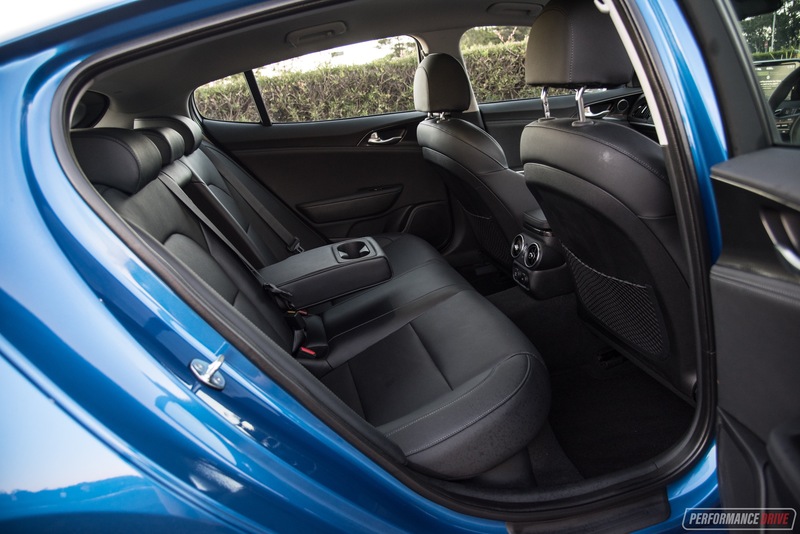 It’s more comfortable and sounds meatier, and you can enjoy the grunt lower in the revs which means you can have a little play in between the traffic lights less conspicuously than in the VXR. Fuel economy is an important factor if you’re planning on using either of these as a daily commuting vehicle. And as a word of warning, we’ll just say this; the fuel consumption in the Commodore is alarmingly high. Despite being around 85kg lighter in weight than the Stinger, at 1695kg, our week-long test revealed a trip computer readout of 12.5L/100km – almost Commodore SS V8 territory. 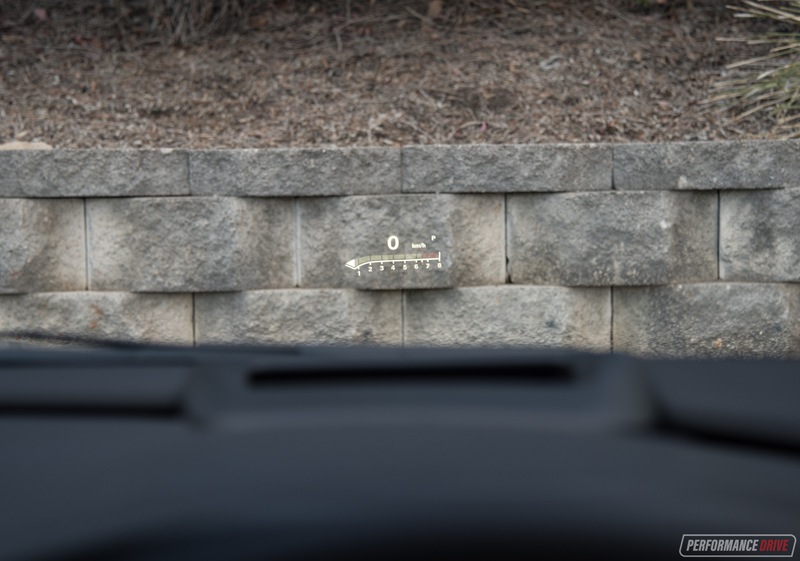 In the Kia, the trip computer, which was reset at the same time, displayed 10.9L/100km. 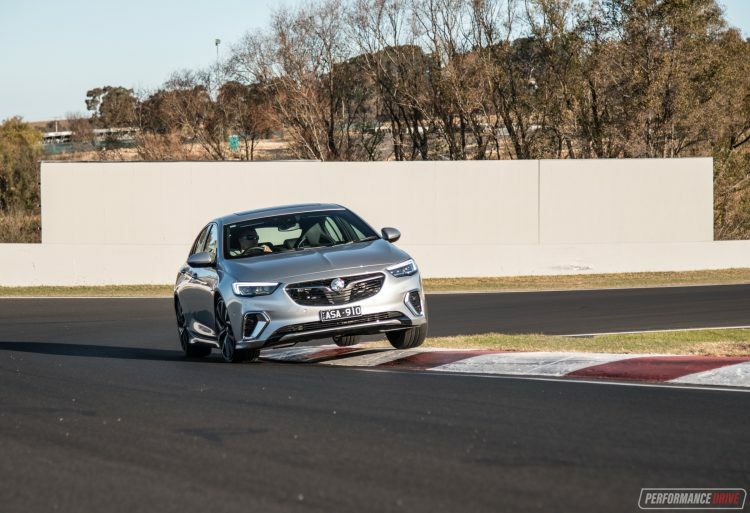 The fact the VXR needs more fuel to shift along at a slower pace than the Stinger means the GM V6 suffers in the advanced technology department. This really is an old-school engine. We must admit, we were already prepared to dislike the Commodore, mostly due to patriotic reasons. But the VXR is surprisingly appealing. 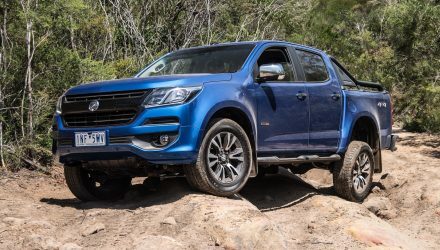 For us, the handling is sharper, with more direct steering and a more confident turn-in, while traction far outstretches the somewhat sloppy Stinger in tight, fast-paced scenarios. This is obviously helped by the clever AWD system. We also love the stereo in the VXR, and the exterior design is quite nice (especially in some of the other colours available). 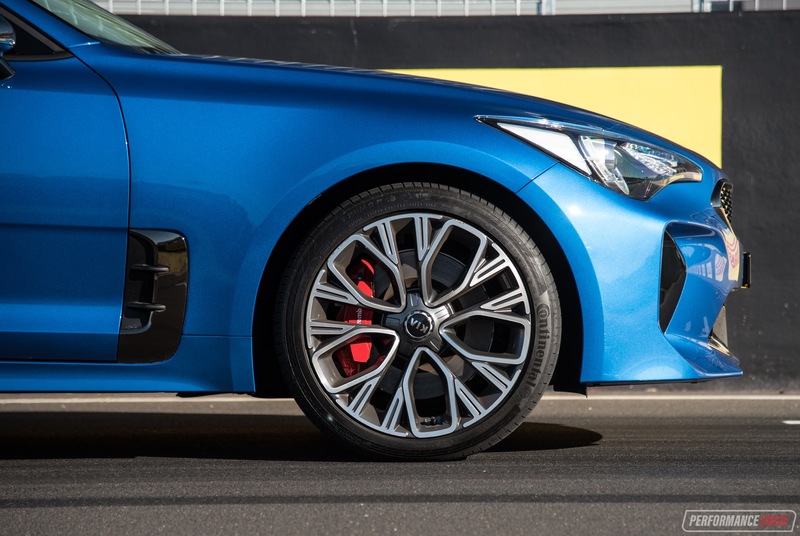 However, superior overall refinement, comfort, build quality, interior ease-of-use, and a smooth and more efficient turbo engine, with rear-wheel drive, means the Stinger 330Si has to win this contest. If only just. 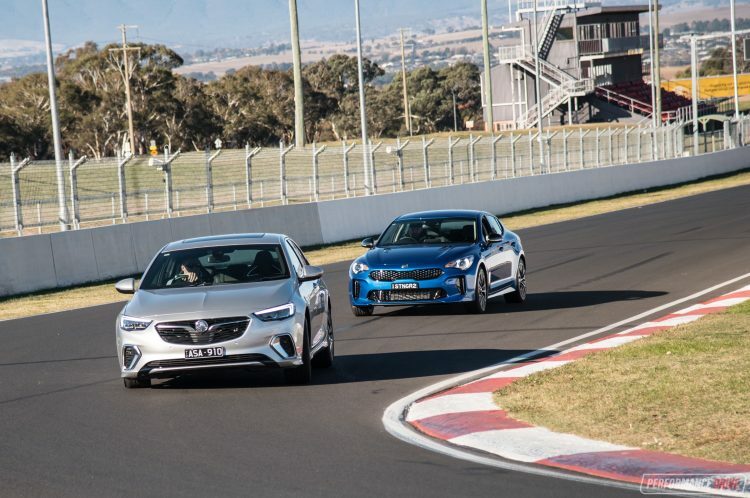 If Holden could implant a more economical turbo engine into the VXR (GM offers a number of awesome new twin-turbo units under the Cadillac brand in the US) and keep the excellent nine-speed auto, it’d be onto a real winner – perhaps even a worthy replacement of the cherished Commodore V8.